From Mohamed Abdelfattah’s International Press Freedom Award acceptance speech, November 24, 2011. With over 500 guests representing the best in the media, legal, and academic fields, the evening’s conversations were both stimulating and pertinent. 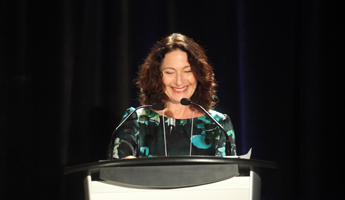 CJFE presented awards to six inspirational individuals whose courage, tenacity and integrity have in turn inspired others to persevere in the name of freedom of expression and press freedom, in Canada, and around the world. Upon arrival, guests were able to view the fascinating International Editorial Cartoon Exhibit Free Expression in Broad Strokes, courtesy of UNESCO, before moving on to the magnificent photo exhibition The Arab Awakening: A Revolutionary Snapshot, highlighting the work of five Canadian photographers who documented the dramatic events that took place in the first few months of 2011—the “Arab Spring.” This moving and informative exhibition was made possible by new Gala sponsor Henry’s, in partnership with the Toronto Star. After welcoming remarks by Carol Off and presentations by CJFE President Arnold Amber and Executive Director Annie Game, awards were given out to recognize six individuals for their commitment to free expression. The 2011 Vox Libera Award, presented posthumously to legendary journalist Ron Haggart, was accepted on his behalf by his daughter, Kelly Haggart. All three of the winners of the first-ever CJFE Integrity Award, scientists Dr. Shiv Chopra, Dr. Margaret Haydon, and Dr. Gérard Lambert, were on hand to receive their awards and address the crowd of over 500 guests. Khaled Al-Hammadi, Yemeni journalist and one of the two award winners, spoke eloquently about the dangers of practicing journalism in his country and how awards like this shed light on the need to protect journalists around the world. And although the 2011 IPFA award winner from Egypt, Mohamed Abdelfattah, could not be present, his acceptance speech, taped in Cairo and projected to the crowd, brought home to us all the dire situation that journalists and bloggers continue to face in Egypt today. Abdelfattah spoke passionately about the need for journalists and citizen journalists to challenge authority, to speak truth to power. His speech, as well as the videos about the international Press Freedom Award winners, can be seen on the CJFE Gala Event Info page. For those of you who came to the event—thank you so much for your support! The event raised critically needed funds to support the work of CJFE in Canada and around the world. Through our legal advocacy work in Canada, raising awareness through outreach and educational activities, and our international support for journalists in distress, CJFE will continue to fight for those essential rights—freedom of expression, and freedom of the press—which are at the heart of civil rights. At the end of the evening, each guest took home a CJFE 2012 Planner, packed with information about the work of CJFE, the 2011 award winners, and facts, dates and quotations about free expression. We hope that these will remind us all, throughout the coming year, of the need to be vigilant, to protect and to strengthen freedom of expression and freedom of the press. We would like to thank the Gala’s major sponsors whose generous support made this event possible—returning major sponsors Scotiabank, CTV and CBC, and new CJFE Gala sponsor, Henry’s. Read more about the event, and watch the videos here.